2. Rational Thought - I would stop and think about the things that were actually stressing me out. For example, I have a paper to write. Is worrying about it going to get the paper written? No. So, I would make a list of the things I actually needed to do to get it done. 3. Saying No - We are a generation of multi-taskers. In my opinion, we do too much. Why do we take on so many things? Learn to say no. If you are stressed out all of the time, you are probably doing too much. I'm curious - what do you do to manage stress? Great Outfit of the Week. Nice pattern-mixing. I Love the skirt, shoes & necklace. Your last DIY was great, too. Cute outfit! And if that is your new fence on the left side of the picture - it looks great! I'm with you on trying not to stress out, I recently just started telling myself to let things go. I help de-stress by going to my husbands softball games and taking the dogs on play dates ;). No but in all seriousness, the best way I have found lately to relieve stress is to leave work by 6 pm everyday. I used to be able to work all night long and it just made me crazy. Now I make myself call it quits at 6 because let's be real, spending all that time working and stressing isn't worth it! I don't do a great job of managing stress, so I won't comment on that, but I do agree that we tend to do too much and stress too much. I manage stress by going running. I know you're probably shocked about that :) haha. But seriously, prayer is good. Or a great worship song. I always wonder what there is to be stressed about when I'm busy singing to some Jesus music. I so love this challenge! The reminder about prayer is such a good one, sometimes we'll try to solve it all ourselves, which ultimately just leads to more stress. Fun pattern mixing today too, so pretty! I drink wine to manage stress - ha ha ! LOVE your shoes and graffic skirt. I think that is GREAT advice. I'm a stressor and your 3 pieces of advice to relieve stress are spot on! I pray! Stress is definitely something i'm trying to deal with. I love your outfit and the print mixing!! 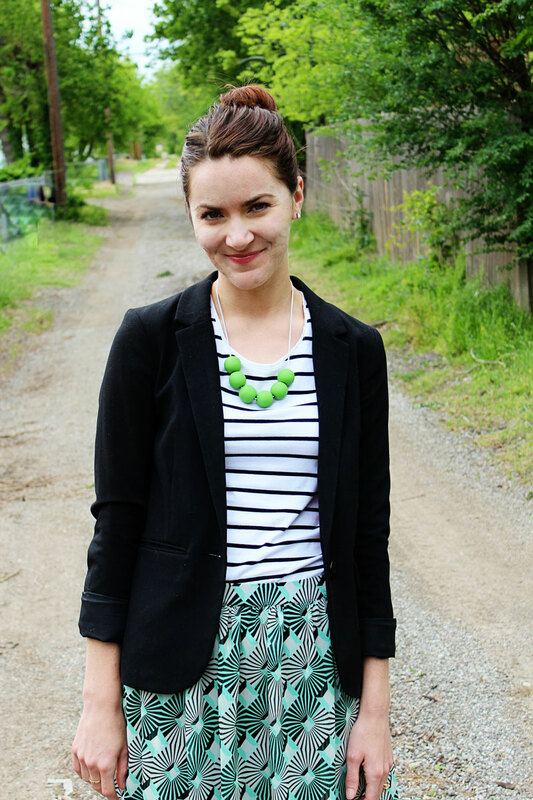 That skirt is so fun, and I love it with the blazer and stripes! Great post. I stress way too much and these tips are so true. I am also the oldest child. Neither of my parents are and as such, they have no clue. I always feel pressure, even though I can't say they put pressure on me. It's just that on the inside I feel so obliged to do everything perfectly, never sit down and relax (or I could be called lazy),... It's me that puts the pressure on me, so I need to learn to put it off my shoulders too. Saying no is definitely the hardest part... So many people I want to see happy! But you're right. I'll take your tips into consideration! Secondly, your advice is soooo great!!!!! I get stressed easily but as I get older I'm trying to manage it better. Last month didn't happen so well. It literally ate me up and spit me out. Stress is one of the hardest things to deal with but such an easy thing to obtain. Love those outfit and the SHOES! I honestly don't stress much (my husband does that enough for both of us - ha!). But if I do, I try to remember to take it to the Lord. He's much better at handling my life than I am!! 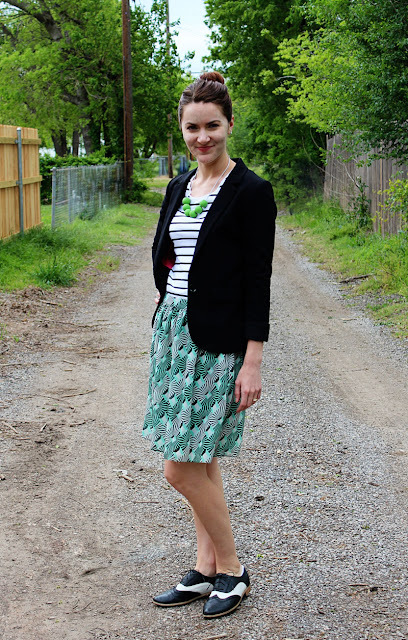 I love this skirt on you! 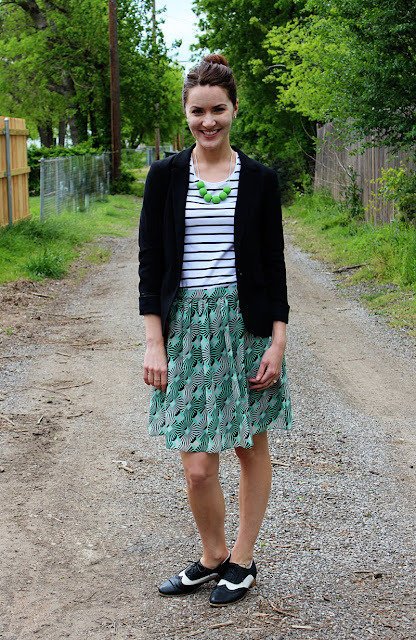 Love the green on you and those oxfords are the bees knees!